In Part 37 of asp.net gridview tutorial, we discussed about using sqldatasource control with detailsview. In this video, we will discuss about using objectdatasource. We will be using tblEmployee table for this demo. If you need sql script to create this table, please refere to Part 37 by clicking here. To use objectdatasource controls, to retrieve employee data, we need to create employee data access layer. Step 1: Add a class file with name EmployeeDataAccessLayer.cs. Copy and paste the following code. Step 2: Build your solution, so that the employee data access layer class is compiled. Step 5: Configure ObjectDataSource1 control to retrieve data from EmployeeDataAccessLayer. Use GetAllEmployeesBasicDetails() as the SELECT method. Step 6: Asscociate ObjectDataSource1 control with Gridview1 control. Step 7: Configure ObjectDataSource2 control to retrieve data from EmployeeDataAccessLayer. Use GetAllEmployeesFullDetailsById(int Id) as the SELECT method. The value for the parameter - Id should come fromt the selected row in GridView1 control. Step 8: Associate ObjectDataSource2 with DetailsView1 control. 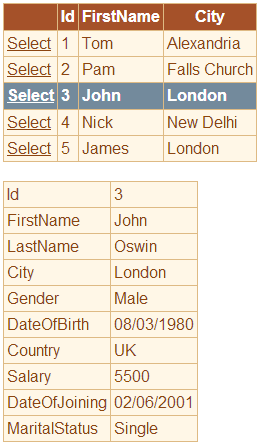 GridView1 DataKeyNames property to "Id"